California’s climate is characterized by the largest precipitation and streamflow variability observed within the conterminous US This, combined with chronic groundwater overdraft of 0.6–3.5 km3 yr 1, creates the need to identify additional surface water sources available for groundwater recharge using methods such as agricultural groundwater banking, aquifer storage and recovery, and spreading basins. High-magnitude streamflow, i.e. flow above the 90th percentile, that exceeds environmental flow requirements and current surface water allocations under California water rights, could be a viable source of surface water for groundwater banking. Here, we present a comprehensive analysis of the magnitude, frequency, duration and timing of high-magnitude streamflow (HMF) for 93 stream gauges covering the Sacramento, San Joaquin and Tulare basins in California. The results show that in an average year with HMF approximately 3.2 km3 of high-magnitude flow is exported from the entire Central Valley to the Sacramento-San Joaquin Delta often at times when environmental flow requirements of the Delta and major rivers are exceeded. High-magnitude flow occurs, on average, during 7 and 4.7 out of 10 years in the Sacramento River and the San Joaquin-Tulare Basins, respectively, from just a few storm events (5–7 1-day peak events) lasting for 25–30 days between November and April. 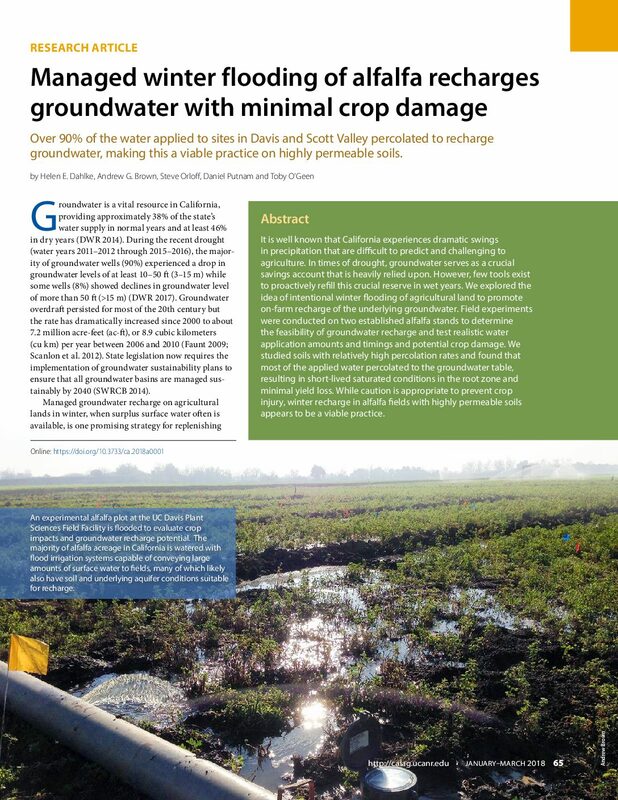 The results suggest that there is sufficient unmanaged surface water physically available to mitigate long-term groundwater overdraft in the Central Valley. Groundwater management is important and challenging, and nowhere is this more evident than in California. Managed aquifer recharge (MAR) projects can play an important role in ensuring California manages its groundwater sustainably. 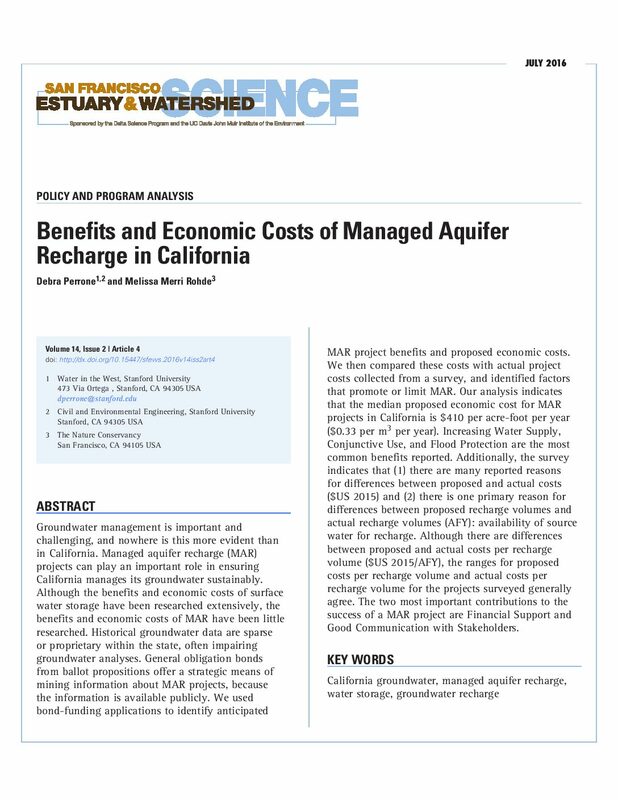 Although the benefits and economic costs of surface water storage have been researched extensively, the benefits and economic costs of MAR have been little researched. Historical groundwater data are sparse or proprietary within the state, often impairing groundwater analyses. General obligation bonds from ballot propositions offer a strategic means of mining information about MAR projects, because the information is available publicly. We used bond-funding applications to identify anticipated MAR project benefits and proposed economic costs. We then compared these costs with actual project costs collected from a survey, and identified factors that promote or limit MAR. Our analysis indicates that the median proposed economic cost for MAR projects in California is $410 per acre-foot per year ($0.33 per m3 per year). Increasing Water Supply, Conjunctive Use, and Flood Protection are the most common benefits reported. Additionally, the survey indicates that (1) there are many reported reasons for differences between proposed and actual costs ($US 2015) and (2) there is one primary reason for differences between proposed recharge volumes and actual recharge volumes (AFY): availability of source water for recharge. Although there are differences between proposed and actual costs per recharge volume ($US 2015/AFY), the ranges for proposed costs per recharge volume and actual costs per recharge volume for the projects surveyed generally agree. The two most important contributions to the success of a MAR project are Financial Support and Good Communication with Stakeholders. The extreme drought that has gripped California over the past several years is causing onerous adjustments in the natural and human environments. Agriculture, which uses much of the state’s water, is at the center of many of these arduous responses. 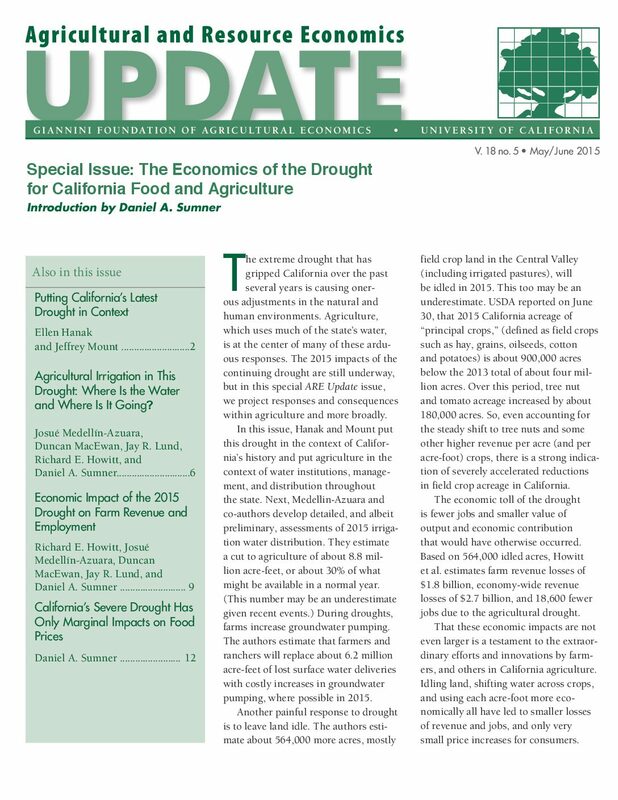 The 2015 impacts of the continuing drought are still underway, but in this special Agriculture and Resource Economics Update issue, we project responses and consequences within agriculture and more broadly. In this issue, Hanak and Mount put this drought in the context of California’s history and put agriculture in the context of water institutions, management, and distribution throughout the state. Next, Medellin-Azuara and co-authors develop detailed, and albeit preliminary, assessments of 2015 irrigation water distribution. They estimate a cut to agriculture of about 8.8 million acre-feet, or about 30% of what might be available in a normal year. (This number may be an underestimate given recent events.) During droughts, farms increase groundwater pumping. The authors estimate that farmers and ranchers will replace about 6.2 million acre-feet of lost surface water deliveries with costly increases in groundwater pumping, where possible in 2015. Another painful response to drought is to leave land idle. The authors estimate about 564,000 more acres, mostly field crop land in the Central Valley (including irrigated pastures), will be idled in 2015. This too may be an underestimate. USDA reported on June 30, that 2015 California acreage of “principal crops,” (defined as field crops such as hay, grains, oilseeds, cotton and potatoes) is about 900,000 acres below the 2013 total of about four million acres. Over this period, tree nut and tomato acreage increased by about 180,000 acres. So, even accounting for the steady shift to tree nuts and some other higher revenue per acre (and per acre-foot) crops, there is a strong indication of severely accelerated reductions in field crop acreage in California. The economic toll of the drought is fewer jobs and smaller value of output and economic contribution that would have otherwise occurred. Based on 564,000 idled acres, Howitt et al. estimates farm revenue losses of $1.8 billion, economy-wide revenue losses of $2.7 billion, and 18,600 fewer jobs due to the agricultural drought. That these economic impacts are not even larger is a testament to the extraordinary efforts and innovations by farmers, and others in California agriculture. Idling land, shifting water across crops, and using each acre-foot more economically all have led to smaller losses of revenue and jobs, and only very small price increases for consumers. California’s development and success have been shaped by its ability to manage floods. This management has varied over the history of California’s economic and political development and continues in various forms today. California will always have flood problems. A range of options are available to aid in flood management problems and have been used over time. These options can be contrasted with flood management elsewhere and the types of options used to manage other types of hazards in California, such as earthquakes, wildfires, and droughts. 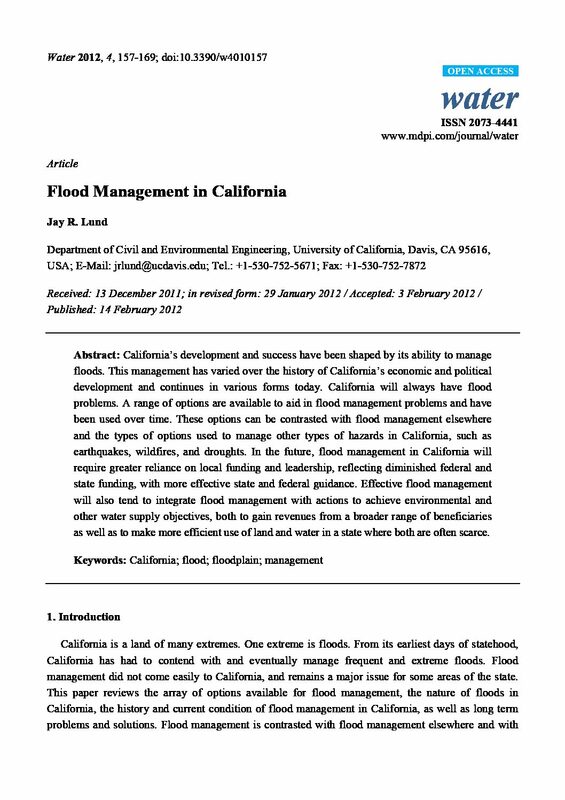 In the future, flood management in California will require greater reliance on local funding and leadership, reflecting diminished federal and state funding, with more effective state and federal guidance. Effective flood management will also tend to integrate flood management with actions to achieve environmental and other water supply objectives, both to gain revenues from a broader range of beneficiaries as well as to make more efficient use of land and water in a state where both are often scarce. How are Western water districts managing groundwater basins? 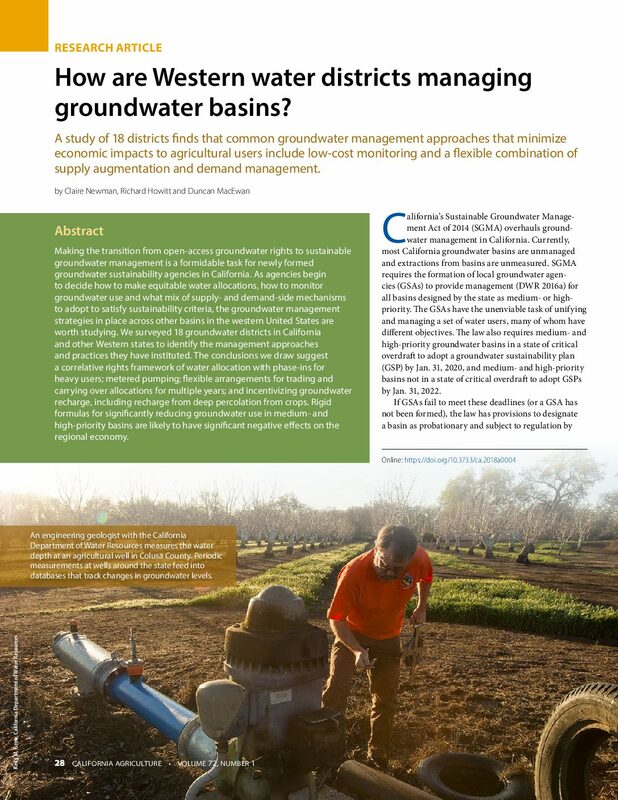 Making the transition from open-access groundwater rights to sustainable groundwater management is a formidable task for newly formed groundwater sustainability agencies in California. 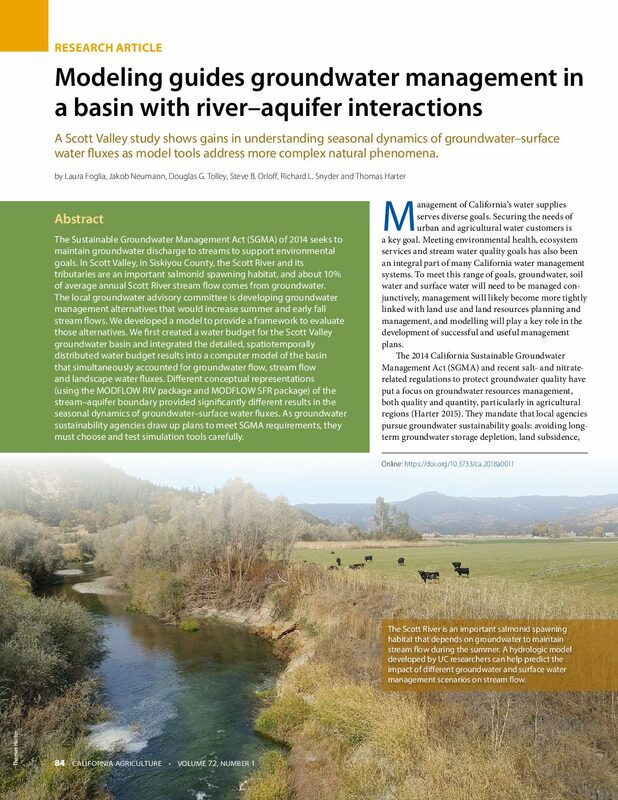 As agencies begin to decide how to make equitable water allocations, how to monitor groundwater use and what mix of supply- and demand-side mechanisms to adopt to satisfy sustainability criteria, the groundwater management strategies in place across other basins in the western United States are worth studying. We surveyed 18 groundwater districts in California and other Western states to identify the management approaches and practices they have instituted. 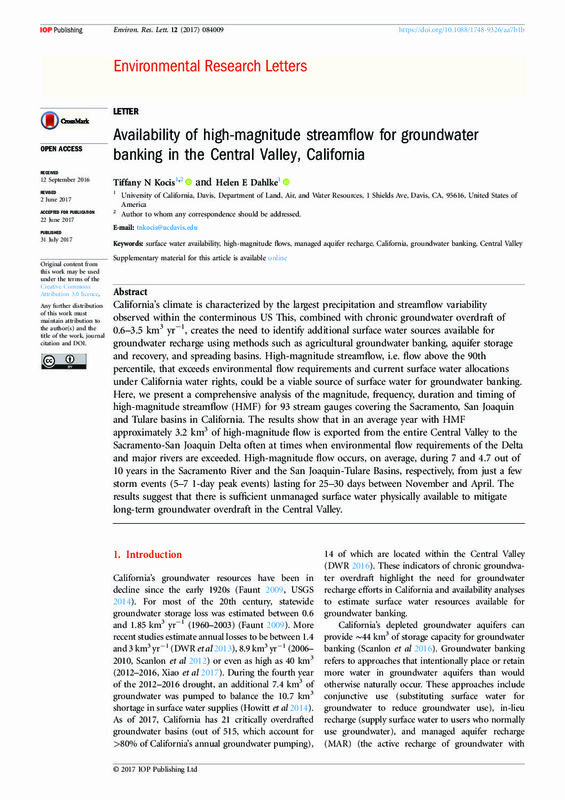 The conclusions we draw suggest a correlative rights framework of water allocation with phase-ins for heavy users; metered pumping; flexible arrangements for trading and carrying over allocations for multiple years; and incentivizing groundwater recharge, including recharge from deep percolation from crops. Rigid formulas for significantly reducing groundwater use in medium- and high-priority basins are likely to have significant negative effects on the regional economy. Current legislation and state plans for the California Delta call for large-scale restoration of aquatic and terrestrial habitats, which will require significant changes in land uses and cultural patterns to achieve. Yet landscapes that are restored for habitat for other-than human species will remain subject to human uses. This report looks at how human presence can and will continue after restoration, and considers how these uses can be best reconciled with cultural, ecological and adaptive management goals. Our one year study builds off other research projects that have explored the California Delta from an integrative human-environment perspective. It uses a landscape planning approach that attempts to push beyond single sectoral methods, seeking a holistic integration of multiple goals and land use agendas spanning across ecological, social, economic and political domains. 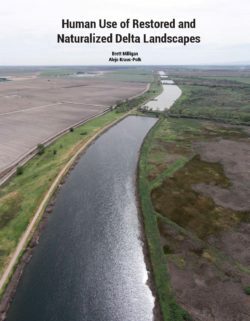 This report’s findings are based on surveys, interviews, review of existing Delta planning literature, field work and specific landscape case studies. In general, our research supports the advancement of a reconciliation approach, which seeks synergies between ecosystem needs and the desires of those who live, work and play in the Delta, both now and in the future. It is well known that California experiences dramatic swings in precipitation that are difficult to predict and challenging to agriculture. In times of drought, groundwater serves as a crucial savings account that is heavily relied upon. However, few tools exist to proactively refill this crucial reserve in wet years. We explored the idea of intentional winter flooding of agricultural land to promote on-farm recharge of the underlying groundwater. Field experiments were conducted on two established alfalfa stands to determine the feasibility of groundwater recharge and test realistic water application amounts and timings and potential crop damage. We studied soils with relatively high percolation rates and found that most of the applied water percolated to the groundwater table, resulting in short-lived saturated conditions in the root zone and minimal yield loss. While caution is appropriate to prevent crop injury, winter recharge in alfalfa fields with highly permeable soils appears to be a viable practice. The Sustainable Groundwater Management Act (SGMA) of 2014 seeks to maintain groundwater discharge to streams to support environmental goals. In Scott Valley, in Siskiyou County, the Scott River and its tributaries are an important salmonid spawning habitat, and about 10% of average annual Scott River stream flow comes from groundwater. The local groundwater advisory committee is developing groundwater management alternatives that would increase summer and early fall stream flows. We developed a model to provide a framework to evaluate those alternatives. We first created a water budget for the Scott Valley groundwater basin and integrated the detailed, spatiotemporally distributed water budget results into a computer model of the basin that simultaneously accounted for groundwater flow, stream flow and landscape water fluxes. Different conceptual representations (using the MODFLOW RIV package and MODFLOW SFR package) of the stream–aquifer boundary provided significantly different results in the seasonal dynamics of groundwater–surface water fluxes. As groundwater sustainability agencies draw up plans to meet SGMA requirements, they must choose and test simulation tools carefully. 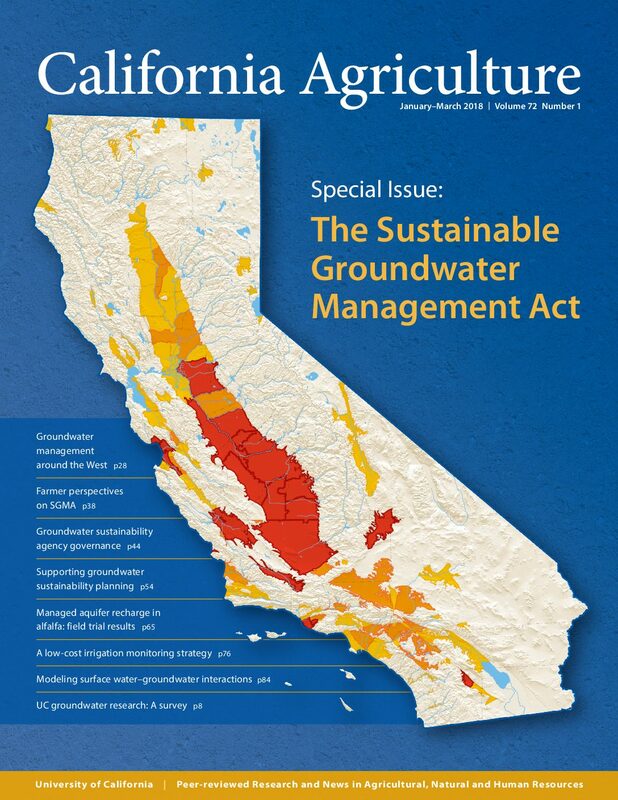 This special issue of California Agriculture focuses on the implications of the Sustainable Groundwater Management Act, or SGMA, the package of bills signed into law by California Gov. Jerry Brown in September 2014. The legislation puts California on a path to the sustainable management of a resource that accounts for between one-third (in wet years) and two-thirds (in dry years) of the state’s water use. In dry years, statewide overdraft is in the range of 3 to 7 million acre-feet. Some of that is recharged in wet years, but in many basins, including some of the state’s top-producing agricultural regions, the long-term trend has been falling water tables (see groundwater.ucdavis.edu for links to UC video introductions to groundwater in California and SGMA). Sustainable management under the act is defined as the avoidance of “significant and unreasonable” levels of six impacts: (1) lowering of groundwater levels, (2) reduction in groundwater storage, (3) seawater intrusion, (4) water quality degradation, (5) land subsidence and (6) impacts on beneficial uses of interconnected surface waters. Regulation of groundwater in California was long in coming. The state has often been a national leader in environmental policy, for instance on air quality and greenhouse gas emissions. But it was the last state to adopt statewide groundwater regulations (Cannon Leahy 2016). In most basins, groundwater use was unrestricted beyond the basic requirement in the state constitution that all water use be reasonable and beneficial. Of the state’s 515 groundwater basins, SGMA applies to the 127 judged to be high- or medium-priority based on a combination of factors related to current and future groundwater demand and the consequences of overdraft. These 127 basins account for 96% of the state’s groundwater extraction (CASGEM 2018). Twenty-seven of these basins have previously been adjudicated — meaning that they are under a court order to limit overdraft. The act mandated the creation, by June 30, 2017, of a new set of local agencies, groundwater sustainability agencies (GSAs), responsible for complying with SGMA’s directives. To date, 266 groundwater sustainability agencies have been formed, accounting for 378 areas in 141 basins statewide (in many cases there is more than one GSA in a basin; also, GSAs may be formed in low-priority basins even though the law does not require it). The next step is the preparation of groundwater sustainability plans. These plans must put the basin on a path that will lead to sustainable management within 20 years, with interim milestones subject to state review every 5 years. Critically overdrafted basins (map) must submit plans by January 31, 2020; other basins must submit by January 31, 2022. Two state agencies have primary responsibility for supporting the implementation of SGMA. The Department of Water Resources acts as facilitator and evaluator, while the State Water Resources Control Board has an enforcement role, ensuring compliance with the law (see article page 18). 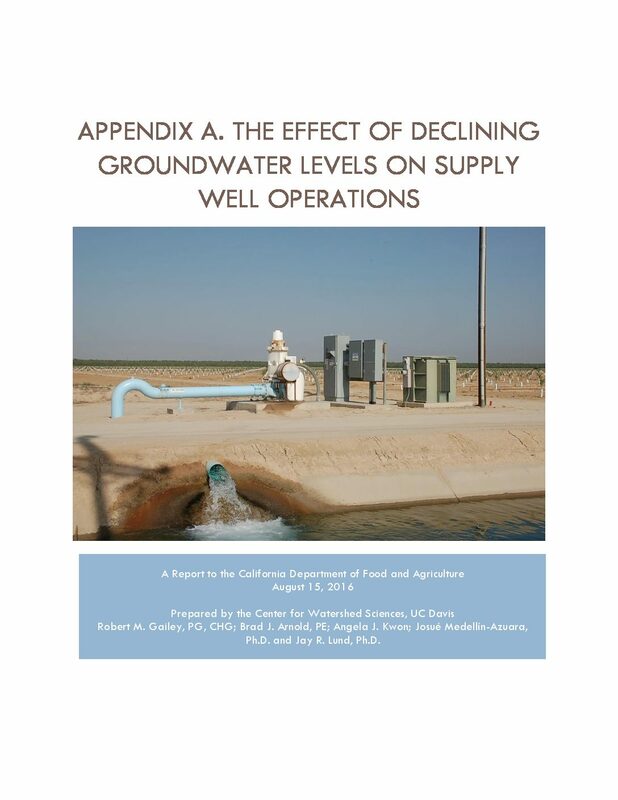 This report explores the impact of droughts on domestic and irrigation well operations. Well completion reports and groundwater depth data obtained from the Department of Water Resources were used in the analysis. The percentages of wells in which the top, middle or bottom of the screened interval became exposed above the pumping water level were calculated and implied maintenance or replacement costs were estimated. Increases in pumping costs from greater depths to groundwater were estimated as well. For our case study, we selected a 27 square mile area in Tulare County, where the California Department of Water Resources has determined that groundwater is in a state of critical overdraft and designated the basin as High Priority under the Sustainable Groundwater Management Act. Results indicate that for the 2015 drought, there was significant potential for incurring well maintenance and replacement costs as a result of drought conditions and water levels approaching critical points in the screened intervals. While the assumptions associated with the current method appear to result in overestimation of impacts, the current drought may have resulted in several million dollars in well maintenance and replacement costs. For irrigation wells that remained in operation, increased depths to groundwater would increase overall pumping costs. About $5.31 per acre ($1.7 per acre-foot) were estimated as increased pumping costs in the recent 2012-2015 drought. While these costs are not large on a per acre basis, they may be significant when incurred across large agricultural areas. This proof of concept analysis highlights the value of information on groundwater levels and well constructions for estimating impacts of droughts on long term groundwater pumping capacity and operation. This analysis can be extended for the entire Central Valley in an effort to quantify the impacts of drought and the importance of groundwater management.